Video is quickly becoming one of the most popular forms of content marketing for both B2Bs and B2Cs in a wide array of industries. Today, most companies have their own YouTube channels and share original videos on their social media accounts. Take advantage of the power of video marketing by embedding videos in your publications or placing a video to the left of the cover page. They also add interest to your publications and make them more enjoyable and entertaining to read. Doing this is also a great way to drive traffic to your YouTube channel. Having web URLs in your digital publications gives readers the ability to easily access your relevant web content. By creating weblinks in your publications you can encourage your readers to visit your website, social media pages, landing pages, or any other site you’d like them to see. Readers like having the ability to easily visit your website and the web pages of your advertisers, which is why weblinks receive high click-through rates. 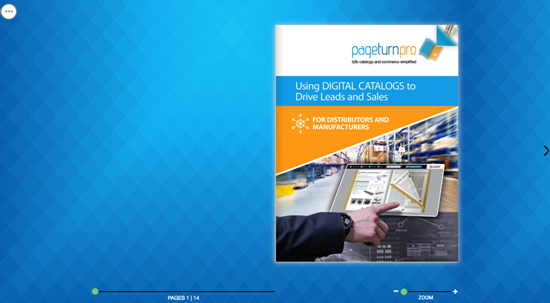 Think of your digital publications as not only pieces of marketing collateral but also as lead generation tools. Include email links in your digital publications so that interested readers can easily contact your company, particularly sales representatives and customer support agents. By doing this, you’ll see an increase in inbound leads and sales. Providing your readers with an easy way to reach you is the best way to ensure that they contact you. You should design your digital publications with your client base and target audience in mind. What are the articles or topics covered in your publication that they’ll be most interested in? Use internal page links so that readers can easily jump to the content they want to read. Many of our clients create internal links for their table of contents for this purpose. Our newest publication viewer, the Flex Viewer, makes publications more engaging because readers are able to customize the look and feel of the publication. They can collapse or expand the features menu, they can enable or disable an automatic page flip functionality, and they can decide to view the publication as single or double pages. Users appreciate having the ability to configure the settings based on their personal preferences. Enabling email and social media sharing benefits both you and your readers. When they share your publications – whether via email or on social media, or both – your reach expands and you gain exposure to new audiences. People in these new audiences may be interested in your business and by seeing your publication they may become clients or readers. For your readers, they’re able to easily post your publication to their social media accounts or pass along your publication to their friends, family, and colleagues. Users want an easy, convenient experience, and these features provide them with that. If you’re interested in learning more about any of these features, we’d be more than happy to schedule a call or demo.